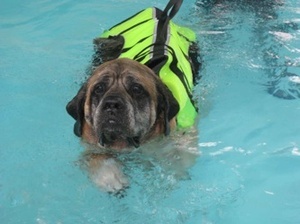 Dogtime salutes Oklahoma’s Great Plains Mastiff Rescue. Our organization was started when a small group of Mastiff lovers in Oklahoma noticed the lack of rescue in the region and chose to do something about it. For years they helped other rescues in surrounding states, but knew that something more permanent needed to be set up in Oklahoma. We have since grown into a regional rescue that takes dogs primarily from Oklahoma and Texas, but have taken them from as far away as Iowa and Louisiana. Great Plains Mastiff Rescue is a not-for-profit 501(c)3 organization made up of volunteers dedicated to saving Mastiffs in need. Our goal is to find a forever home and family for every Mastiff that we rescue. 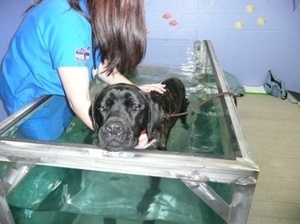 We health check each Mastiff that comes into our rescue program. This includes vaccinations, spay/neuter, testing for worms and parasites and treatment, heartworm testing and treatment, and microchipping. Mission Statement: This organization aims to further the prevention of cruelty to animals with emphasis on the recovery of pets from life termination procedures and the ultimate adoption of such animals by the private sector, as well as education on how to prevent the overpopulation and unnecessary killing of animals. We have had dogs come to us from just about every circumstance. Many of our dogs come from shelters. We are either contacted by the shelters themselves or we see them on Petfinder.com. We have active volunteers throughout Oklahoma, Kansas, Texas, and Arkansas who have created many relationships with local animal welfare facilities to ensure that we are contacted if/when a Mastiff comes into their care. We also have been receiving an increased number of owners surrenders–a swell that we have contributed to the current state of the economy. Big dogs = big bucks and many people’s first move toward “downsizing” is getting rid of, or to begin to neglect, their dogs. There are also those unique situations that we come across, such as strays that have been abandoned by their owners, puppy mill raids, and even Craigslist ads. All our animals are fostered by loving, caring foster homes who have opened up their hearts to dogs in need. We have an amazing group of individuals and families who are passionate about these dogs and do everything in their power to help them on their way to their forever homes. After coming into our program, all our dogs immediately go to the vet to receive any and all medical care they need. This includes vaccines, spaying & neutering, heartworm treatments, physical therapy, and any and all other necessary procedures. We also have a required 2-week period that each of our dogs have to remain in foster care. This is to ensure that we get to know the dog’s personality as well as possible to guarantee we are placing them into the correct home environment. While in GPMR, all our dogs are treated with the love, care, and patience that any dog lover would show their own pet. Job (as he was known in GPMR) was found in an abandoned house where he was left in deplorable conditions. The situation was nothing less than what you would see on any animal police show. He was extremely underweight and dehydrated when he was found. A Good Samaritan rescued him and brought him to the emergency vet, who then contacted us. He was hospitalized for several days and on IV fluids to help get him back to health. We think Job was seven or eight years old when he first came into rescue, though he had a beautiful, timeless personality. He was the epitome of a gentle giant. While in foster care we learned that he loved to sunbathe and enjoyed rolling around in the grass. And he even figured out how to open doors to get outside to enjoy the sunlight! People all over the country followed Job’s progress, as his story was one of the most touching one we have experienced as a rescue. Job’s forever family found him on Petfinder.com one evening. They contacted us from Virginia and after talking with them about his story, we all knew it was meant to be. They renamed him Joe and said he loved to stop and smell the flowers. Shortly after adoption he was diagnosed with kidney failure, but his family never gave up on him. He lived for another year and a half before passing away in October 2009. During that time he worked as a Therapy Dog and was a favorite with those who were lucky enough to know him. Job was a one-of-a-kind dog who was cherished by his one-of-a-kind family. Karma was picked by animal control on the side of the road near Kansas City, KS. Not only was she starving when she was found, but sometime in her short life she was hit by a car and never treated. GPMR volunteers rallied and thanks to the help of several rescuers she made her way to Oklahoma. This girl has a phenomenal personality-she never complained even though it was obvious her injuries were extremely painful. X-rays of Karma’s hips showed that one had been broken at some point and was never treated. Unfortunately the surgeon was not able to repair the fracture, but instead performed a Femoral Head Ostectomy (FHO) to remove the broken parts to take away the pain. Once Karma healed from surgery she went through a lot of physical therapy-including several sessions on an underwater treadmill! Karma’s foster family picked her name because she brought so much good karma to our rescue. And her name sure proved to be true-soon after arriving to GPMR we adopted out nearly every Mastiff we had in the program. Karma helped promote our rescue’s plight with her story and we received emails from all over the country asking about her progress.